Weekend Getaways in North Georgia: Who doesn’t love a great weekend getaway? For most of us, getting away from our lives, even if it is just for a few days, lifts our minds, body, and spirit. So let’s experience new adventures – and the perfect place forth this trip is the North Georgia Mountains. Weekend getaways in our corner of North Georgia will be filled with so much fun and relaxation you may never want to go home. 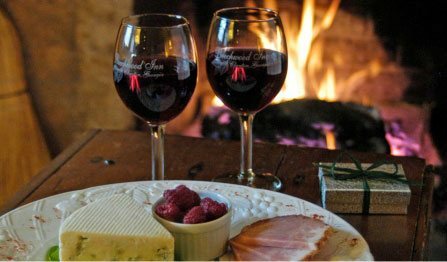 Weekend Getaways in North Georgia: Who doesn’t love a great weekend getaway? For most of us, getting away from our lives, even if it is just for a few days, lifts our minds, body, and spirit. So let’s experience new adventures – and the perfect place forth this trip is the North Georgia Mountains. Weekend getaways in our corner of North Georgia will be filled with so much fun and relaxation you may never want to go home. The best place for weekend getaways in North Georgia is the Historic Town of Clayton here in Rabun County. We at Beechwood Inn love our town and enjoy helping our guests find amazing activities while on their weekend getaway to North Georgia. Here are some of the great things you can do while visiting our charming community. Fortify Kitchen and Bar with “Best Chef America” Jamie Allred. This amazing Upscale Farm-to-Table eatery specializes in humanely raised proteins and locally sourced ingredients. Dine here now before Chef Allred collects a James Beard Award and the lines into Fortify get too long. Lake Rabun Hotel features “Best Chef America” Ryan Spruhan who dishes up inspired food in a wonderfully restored resort hotel. At Fromage in Clayton, “Best Chef America” Jenny Wilson makes spectacular lunches for locals and visitors. In the busier season she offers dinner one weekend a month with limited but wonderful menus. Chef Vince Scafitti at the Farmhouse. He offers local cuisine in a romantic out of town valley, one of the most beautiful locations in North Georgia. Here in town the Laurel Bar features small plates “Tapas” cuisine of up and coming Chef Ben Findley. The restaurant and bar is absolutely gorgeous and reminiscent of Beaver Creek, Colorado. We also refer guests to Manrique’s Mexican Restaurant for hand-made authentic Mexican cuisine. Another up and coming chef and restaurant is Charles Maddrey’sSupper Club at Grapes and Beans offering an unexpected but welcome twist on local Southern cuisine. On Main Street in downtown Clayton are several other interesting dining restaurants including Universal Joint, Zeppelyns and Rumor Hazit. 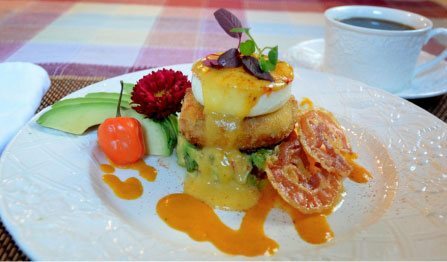 And, finally, of course our own Beechwood Inn features Farm to Table cuisine by “Best Chefs America” Gayle and David Darugh. We know there are times that you just don’t want to travel for a great meal and when you choose us, you won’t have to. Our menu changes to keep up with fresh and local ingredients and while you are waiting on your meal, enjoy the beautiful views of the Black Rock Mountain. So, if you seek an authentic food experience, come to Rabun County Georgia! Outdoor Activities: When you think about weekend getaways in our North Georgia Mountains, get excited about spending a lot of time outdoors. There are many interesting trails all over our area, as well as amazing waterfalls. Let Beechwood Inn Pack you a picnic and enjoy a hike to Minnehaha Falls. This is a quick and easy hike to a 100 foot cascading waterfall, the most photographed and painted waterfall in our area. And there are other many other trails and falls that you can enjoy as well. If you are looking for a more thrilling time outside when on your weekend getaway in North Georgia, be sure to check out Tallulah Gorge, Black Rock Mountain or Moccassin Creek State Parks, all located in Rabun County. Our area also offers white-water rafting, horseback riding and several exciting zip-line tours. Shopping: The Historic Main Street in Clayton is filled with interesting shops and galleries. Taking a stroll down Historic Main Street in Clayton offers a unique visit through history and time. There are antique shops, art galleries, and markets filled with wonderful things that will remind you of your trip to North Georgia long after you have gone home. This is a great way to get to know our town not only today but in the past as well. Many of these shops love telling the history of Rabun County and what has made it the great town it is today. But be sure to get off Main Street to visit Timpson Creek Gallery, and Black Bear Creek Antiques two of my favorite shops for visitors seeking eclectic and wonderful treasures to take home. 12 Spies Vineyards & Farm: Planted in 2008 by owners, Mike Brown and Lisa Romanello, 12 Spies Vineyards overlooks the beautiful upper valley of Rabun County, just a short distance from North Carolina. There tasting room is open and offers spectacular views of the vineyards and surrounding mountains. Stonewall Creek Vineyards Stonewall Creek Vineyards new farm winery/tasting room released a crisp Most grapes are grown, hand harvested, vinified and bottled at the 5-acre vineyard bordering Stonewall Creek in the Northeast Georgia Mountains near Tiger, Georgia. Owners are Carl and Carla Fackler. Tiger Mountain Vineyards Tiger Mountain Vineyards cultivates seven varieties of red grapes and two white grapes. Carefully selected European grapes thrive in the sunny days and cool nights of the growing season in Northeast Georgia. Fifteen acres of grapes are planted in two vineyards at Tiger Mountain, with more than eight acres in production. Beechwood Inn: Makes 4 varieties of wine using grapes from nearby Georgia Vineyards. 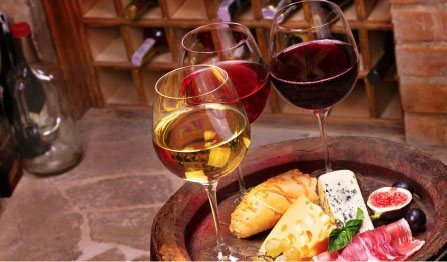 Guests can sample Beechwood Inn wines each day at Wine-Thirty, our managers’ daily reception offering light appetizers and information on our area. When planning weekend getaways, consider coming to our corner of North Georgia. Our town of Clayton offers an interesting experience for every type of traveler. 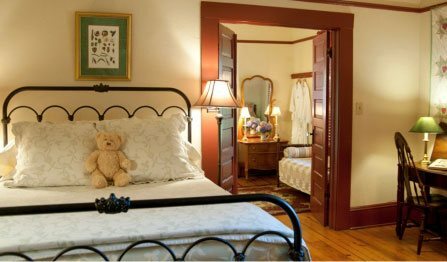 One place visitors love to stay while in Clayton is with us at The Beechwood Inn. We have rooms as well as cabins to accommodate all sorts of group sizes and needs. Are you ready to plan your first in what will be many weekend getaways in North Georgia? Contact our amazing staff today and let us help you plan a wonderful visit to Beechwood Inn and the exciting North Georgia Mountains.